Click here for official entry information. Tallahassee, FL (January 31, 2019) — Good news! 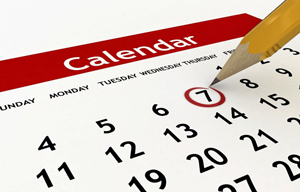 In order to accommodate the challenging schedule posed on the Florida Panhandle due to Hurricane Michael, the Florida Commission on the Status of Women has extended the deadline for the 2019 Florida Women’s Hall of Fame to March 29, 2019. It is the desire of the Commission for all Floridians to have an opportunity to nominate. Nominations for the 2019 Florida Women’s Hall of Fame are now being accepted through March 29, 2019, by the Florida Commission on the Status of Women. The Florida Women’s Hall of Fame commemorates women’s history by honoring and remembering those women whose lives and contributions have improved the quality of life for both Florida and the nation. 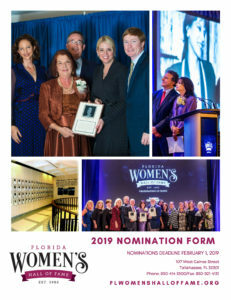 The Commission will accept all nominations for the 2019 Florida Women’s Hall of Fame postmarked by March 29, 2019, or through the website flwomenshalloffame.org/nominate. The Commission will recommend, to the Governor of Florida, ten outstanding women from whom up to three will be chosen for induction. Inductees will be recognized at a special ceremony in October 2019 in Orlando, Florida. This year’s inductees will join current members on the walls of the Florida Capitol. Visitors can view the Hall of Fame members immortalized on plaques in the Capitol Rotunda or on the Florida Women’s Hall of Fame website flwomenshalloffame.org.